Holidaying with a disability can come with some challenges, but it shouldn’t stop you from exploring and seeing the sites, it might just take a little bit of extra planning to get you there. Ideally, travelling with your two-wheeled wagon should be happy and hassle free. But anyone who’s ever gone long haul will know that travel tranquillity can quickly turn to madness and mayhem. Queues, delays and unknowledgeable ground staff can test anyone’s patience. But before you call time-out on your grand plans, take pause. Our guide to disability travel will make holidaying as easy as 1-2-3! With helpful hints from seasoned experts, you’ll score a truckload of travel insurance advice. Cruise your way through the planning process, learning which destinations will cater to those with mobility issues. Plus, we’ll outline top travel tips on how to book your accommodation, flight needs and general assistance. So whether you’re planning an action-packed adventure, or a relaxed retreat, we’ve got you covered. Our guide gets you geared up and ready to go! Travelling can be more testing for some, but don't let that put a downer on your destination dreams. New regulations have meant an increase in attractions, accommodation providers & transport services all having to accommodate to accessible tourism, so be ambitious with your holiday choice. Keep reading for our fun list of accessible holiday ideas. You’ll have a roaring time when you roam with rhinos and amble with African lions on a magical safari. GoAfrica Safaris specialises in trips to Kenya and Tanzania for people with limited mobility. Tourists can travel in adapted vehicles with hoists. The company also gives advice on which lodges and tented camps to choose. Grrrrr! Want to wake up at sea and discover a new destination? These days cruise companies are catering more and more for people with disabilities. Many ships, especially newer ones, are accessible throughout and have adapted cabins at all grades. An excellent choice for those with mobility problems, ships ahoy! Fancy sipping rum punch cocktails in the sunshine? Us too. Virgin Holidays offers plenty of accessible accommodation options plus free use of special beach wheelchairs in selected hotels in Antigua, Barbados and St Lucia. Did you say Pina Colada? Want to get in with the hussle & bustle of the big smoke? A trip to the blighty will give you your fix of culture, ciaos (and questionable climate). Plenty of attractions are fully accessible in London; from the science museum (recognized in 2010 as one of the UK’s best accessible visitor attractions), the Tate Modern (which has touch tours, audio guides and a sign language multimedia guide) the Tower of London (although some parts have difficult stairs) and the London eye (wheelchair number limits apply). With its endless soft sandy beaches, exotic cuisine and more cultural quirks than you can shake a stick at, it’s no wonder more than 800,000 Australians are drawn there each year! Why not book yourself into Villa G at Ellora, a group of 11 villas with no steps and a large pool with hoists for guests with limited mobility. Ellora can also arrange diving and snorkelling for people with disabilities and a three-night accessible safari in East Java and scuba diving in east Bali. Balinese Bliss! Holiday in Hawaii for the ultimate tropical paradise. Access Aloha Travel specialises in organising trips for people with disabilities. Non-profit organisation AccesSurf helps people enjoy the water with tandem surfboards. Hanuma Bay Honolulu even loans out beach wheelchairs for free. Aloha! We know it’s not everyone’s cup of tea, however Disney World and Disney Land are A-mazing when it comes to accommodating for their guests with special needs. Oh go on, you know you want to rub shoulders with Mickey and friends. “Hey! there, Hi! there, Ho! There. You're as welcome as can be. Generally speaking if you have a disability it’s not compulsory to declare it to your insurer. However, it can be tricky to give a blanket rule on cover that applies to all types of disabilities. Keep reading for more information. IS A DISABILITY CLASSED AS A PRE-EXISTING MEDICAL CONDITION? We get that some disabilities may not be considered pre-existing illnesses in the eyes of the beholder. However it can be a bit of a grey area when it comes to insurance. A pre-existing medical condition (in the travel insurance world) can be broadly defined as an illness or injury you have had symptoms of, or received medical treatment for. As a rule of thumb, i f you are after medical coverage for an unforeseen accident or illness on your holiday (that could be loosely related to your disability) then it's best practise to disclose your disability to your insurer. Congenital disabilities like vision or hearing impairments are not considered pre-existing illnesses and are automatically covered by most insurers and no medical assessment is required. Neither are physical or mobility disabilities such as cerebral paulsy or muscular dystrophy where you require the use of wheelchair. Most insurers also automatically cover a range of minor pre-existing medical conditions that wouldn’t be considered to be disabilities such as asthma, hypertension diabetes, epilepsy, osteopenia and more. Provided that the condition has been stable for more than 12 months; there is no planned surgery; and you have not received treatment in the past 12 months. If your disability is under control, you have not been recently hospitalised and your doctor considers you fit to travel, you may be able to obtain cover, though usually at a higher cost. Disabilities that need to be assessed before cover can be granted include: Coronary problems, lung disease, epilepsy, if you've suffered from a stroke, or any illnesses you've had surgery for in the last 2 years. Some conditions are not covered by travel insurance under any circumstances, such as terminal illness or any illness which shortens your life expectancy, organ transplants, psychological & psychiatric disorders. It is important to note, that this information is general in nature and may vary from insurer to insurer. My Disability Isn’t Listed Above, How Do I Know Which Category It Falls Into? All medical conditions are assessed on a case-by-case basis, so if unsure it’s best to complete a medical form even if your disability is completely manageable. You may also be required to obtain a letter from your doctor authorising you are fit to travel. Note: It is compulsory to complete a medical application if you need to be accompanied by a full-time carer on your holiday. Does Travel Insurance Cover Medical Equipment? If you're travelling with a wheelchair, hearing aids, breathing equipment or other expensive apparatus you’re going to want to have it protected when you travel. 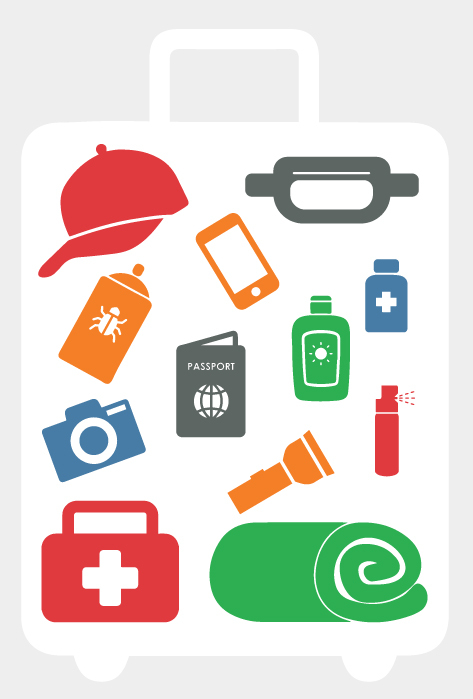 Most travel insurance plans have single item limits that apply to their cover; usually around $750 - $1000 per item. If you have a piece of medical equipment that exceeds this you’ll need to specify it and insure it separately. There is usually an upper limit (most commonly around $5,000) as to how much extra cover you can purchase for your expensive items. Is Your Apparatus Particularly Expensive? If travel insurance doesn’t provide enough protection, you could also look at insuring your valuables under your home and contents policy. Before doing so, check that you are able to travel with the insured items and that they would be covered when you’re away from home. Alternativley Covertec.com.au or business-insurance.aon.com.au may be able to help with cover for particularly expensive apparatus. Does Travel Insurance Cover Wheelchairs? Most Australian travel insurers do not specifically exclude cover for wheelchairs. But as explained above, cover limits will apply. If you have an electronic two-wheeler with all sorts of gismos and gadgets, chances are standard cover isn't going to cut it, so you'll need to look into alternative options as explained above. Almost all airlines will ask you to check your chair into the hold. So make sure yours is protected from those haphazard luggage handlers with a policy that offers cover for your luggage and personal belongings. Look for comprehensive cover that protects your wheelchair from theft, damage and loss that incurs on your travels. Remember, you may not be covered if you leave your chair unattended or out of sight when it was stolen, so keep your eyes on it at all times. Does Travel Insurance Cover Hearing Aids? Hearing aids can vary significantly in value from a couple of hundred into the thousands. Depending on how much yours are worth will make all the difference to your cover options. When comparing travel insurance luggage cover levels, $10,000 limit might sound like plenty, however, what most people fail to realise is that that sub-limits exists for each item. You may in fact only be able to claim a maximum of $750 per item which may not provide enough cover for your high-value hearing aids. If your hearing aids are especially exxy, just like a wheelchair (or any other piece of medical equipment) you’ll need insure those items separately to ensure they are protected when you travel. Refer to additional high value item cover in table above. Does Travel Insurance Cover Prosthetics? Now, we'd hardly class a prosthetic as a piece of luggage, however, it may be a good idea to tell your insurer if you do wear a prosthetic based on the following story. In May 2017 Southern Cross refused to pay a 26-year-old student more than $1,500 for her damaged leg as her prosthetic was considered "baggage" and should have been declared as a specified item. You'll be pleased to hear the insurer has since changed their decision and covered the cost to fix or replace the prosthetic. May this be a lesson to you to declare everything at the time of purchase. However irrelevant it may seem. Our mental illness travel insurance guide can provide further information. Medical: A bout of food poisoning, an unfortunate case of whip-lash, a nasty case of malaria. Really anything can happen on your holidays. Luckily your policy will cover the exorbitant expenses of overseas hospital cover. Cancellation fees and lost deposits: An unexpected earthquake, an unforeseen accident on route to the airport or a severely sick family member would really put a hiccup in your holiday. Your travel insurance will cover cancellations for events such as natural disasters, accidents, hijackings, severe sickness or injury. Luggage and personal effects: Theft, loss and damage to your belongings is common on trips overseas. Your travel insurance has your back when it comes to pocket pinchers and suitcase snatchers. Personal liability: If you injure someone or are held accountable for damaged property the consequences could be disastrous, particularly when you are unfamiliar with local laws and regulations. In such an event, your policy will cover your liability costs, to a degree. Being intoxicated: Whether your drink of choice is a beer or glass of wine, all claims related directly to alcohol and drugs will not be paid. Have fun in moderation! High risk activities: From rock climbing to scuba diving, adrenaline junkies are spoilt for choice on their holidays. But watch out, as participating in risky activities may not be covered by your policy. Be sure to scan your policy’s small print to check out which of your preferred heart pounding activities are covered. Pre-existing conditions: As we've already mentioned, pre-existing conditions or disabilities that exist before you travel are generally not covered. Check your policy wording to see what conditions are covered automatically, and which ones require a medical assessment first. Complaints and ailments are part of life, and unfortunately the older we all get, the more of these we tend to encounter. But that doesn't mean you're over the hill yet. A few handy tips for seniors travel insurance has you ready for white haired wunderlust. Age limits: If you’re over 60 finding reasonably priced seniors travel insurance can be tricky, however this doesn’t mean you should compromise on cover. While a few companies do not cover travellers over the age of 70, there are still plenty of options available. Insurers such as 1Cover, Boomers, Fastcover, QBE have no age limits, and Insure & Go and Travel Insurance Saver cover up until 100 years. Travel insurance increases in price the older you get: Even if you are fitter than most without any pre-existing conditions or mobility issues you will probably find that your travel insurance quotes are higher than younger holiday makers. Pre-existing disabilities can be a concern for senior travellers: It’s essential to declare all pre-existing illnesses to your insurer, as failing to do so could potentially invalidate your entire policy. Disclosing your condition won’t necessarily hike up the price of your policy. Rather, providing your insurer with a thorough health evaluation can help you access the best possible medical assistance should you require it. In the worst case scenario, not disclosing your condition(s) can hinder your treatment and see you liable for significant medical costs. Watch out for cruise cover: If you’re planning to hop on board, picking the correct destination is essential when buying travel insurance. Many people don’t realise that once your cruise ship has left port, you are no longer covered for hospital or medical expenses by Medicare or your usual private health care provider. Even if you’re just cruising around Australia, make sure you purchase a Pacific policy so that you’re protected on board. Beware of increased excesses and any benefit limits that apply: Insurers will often increase the excess payable on medical claims for senior travellers. So, it’s a good idea to understand how much you’d need to pay if you ended up in hospital to avoid any nasty surprises at claim time. A standard excess of around $100-$200 is often increased to $2,000 - $3,000 for travellers 80 years and over for claims that relate to injury or illness. The standard excess generally remains unchanged for non-medical events, such as lost luggage. Even for those without disabilities, trips overseas can be daunting. You don’t speak the language, you don’t know your way around, the food isn’t what you’re used to. But that’s all part of the adventure! Everyone with a disability has different needs and it might even take a couple of trips to get the right balance of a relaxing break, without all the comforts of home. Take the plunge by following some of our tips for travelling with a disability below. First things first, you need to decide on a destination that’s going to be brilliant and not a burden. When choosing your accommodation, pick a place that’s centrally located so you’re close to attractions, restaurants, shops. Booking a place that’s truly accessible should also be your number one priority. What may be deemed "accessible" at home may not be the same abroad. Make sure you understand the situation with toilets, ramps, steps, lifts, pool access thoroughly before you hand over your credit card. Cobbled stone lanes, narrow streets and steep steps may be the makings of a fairytale, but not ideal for those on a set of wheels. Don’t let your chair hinder your holiday dreams, research your route so you don't suffer from destination disappointment. Know what you're getting into before you arrive so you can be prepared. Flying can be trying whether you have a disability or not. Delays, gates that take an hour to get to, lost luggage, you name it. When booking flights, book an aisle seat near a toilet and inform staff of your needs when boarding. Arrive early at the airport to avoid the worst of the queues and to ensure you are not rushed and worried. When booking flights the airline will need to know the dimensions of your wheelchair and will want to know if it is manual or electric. Consider how frustrating it would be to try and fix a flat or in a foreign terrain. Make sure your two-wheeler is in good nick before it goes on its holidays. Most airlines won’t allow you to take an electric wheelchair in the cabin, so take everything out of the storage compartments before checking it in. Puppy protectionAssistance dogs are generally allowed to travel on the floor of the cabin on domestic flights. International flights may be trickier because of quarantine laws and airport rules in the country you're travelling to. You'll also need to consider the requirements when returning your prized pup back into Australia. Our guide to travelling with pets can help further. Check for disability discounts at major tourist attractions. In most of Europe, admission to attractions is free for people with disabilities while the carer pays a reduced price, or vice versa. Cha Ching! If you have a mobility parking badge, take it with you - the sign for people with disabilities is universal. Some attractions need to be booked and paid for in advance. In Australia, you can also get an free ticket to many attractions using a National Companion Card. Whoop whoop! Planning a road trip? Pre-book your wheelchair modified vehicle well in advance if you so need. Turning up to the airport without a ride could really put dampener on your holiday dreams. The key to successful holidays when you have mobility difficulties is planning and preparation! If you’ve decided to visit the Vatican, gander at the Grand Canyon or snorkel in the Barrier Reef, make sure that your tour operator knows your requirements before you finalise the booking. If you’re organising with an accessible tourism company, chances are they have it all covered already. If not, ask about access, ramps, steps, toilets, tour numbers and whether they regularly cater for those with disabilities. Pack enough to cover the length of your entire trip, you wouldn’t want to be in the Mozambique and misplace your meds. Medications have different names throughout the globe, so know the actual drug you require, not just the brand. Different countries have varying guidelines on what is legal, (e.g. medicinal marijuana) so check this before you go booking an exotic escape and end up banged up abroad. Oh er! Everyone who travels needs travel insurance whether they have disabilities or not. Accidents happen, and if you find yourself ill or injured in a foreign country, you could be faced with huge medical bills for treatment and hospitalisation. Trips also get cancelled for a variety of reasons and bags get lost or stolen every day, so travel insurance is simply a form of protection that ensures you won’t have to foot the entire bill yourself if the worst does happen. Travelling by chair involves a little more consideration when packing. Necessary items go well beyond clothing and toiletries and can involve potentially fragile medical equipment and must-have medications. Whether you've decided to have an African adventure or Balinese beach break, it's vital to get organised before your trip. With visas to schedule, vaccinations to get, itineraries to plan and travel arrangements to book, we'd forgive you for being a tad overwhelmed. The following useful links will help take some of the stress out of the prepping.